A. Why to choose our System ? Nitrogen Injection based Transformer Explosion and Fire Prevention System. Drain and stir method utilizing nitrogen gas as stirring medium. On activation, the system extinguishes fire within few seconds. Acts as Transformer explosion prevention and fire extinguishing system. 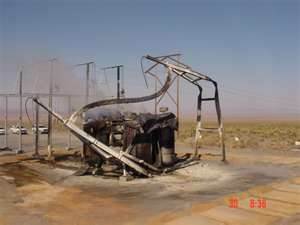 Acts as fire prevention in case oil drain activity commences prior to tank/bushing rupture. Nitrogen Gas is inert and does not react with transformer oil. Forms insulating layer (Thermal) on top surface of the oil. 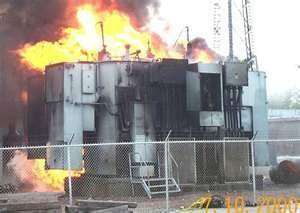 Fighting transformer oil fires are difficult and costly using conventional Fire Prevention equipment for Transformer. Most of the sites are equipped with Fire fighting system for transformer using fire extinguishers which are inadequate to extinguish the fire causing loss to the equipment and property . Causes loss of revenue and loss of income. Purchasing of replacement power, transformer and surrounding equipments involve high cost. Polluting the environment destroying public relations. leads to complete blackout of a region or a country which may further lead in the financial consequences. Cost of our System is negligible comparing to the overall loss.